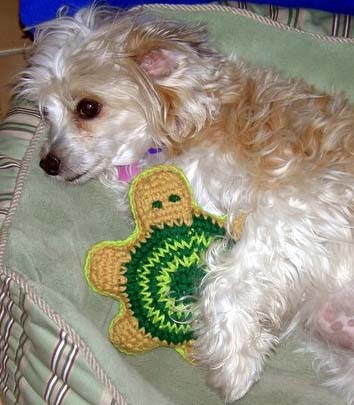 This friendly cotton turtle is loved by both pets and people (from kids to collectors)! Gauge: 16 sts and 16 rows = 4”/10 cm in single crochet. 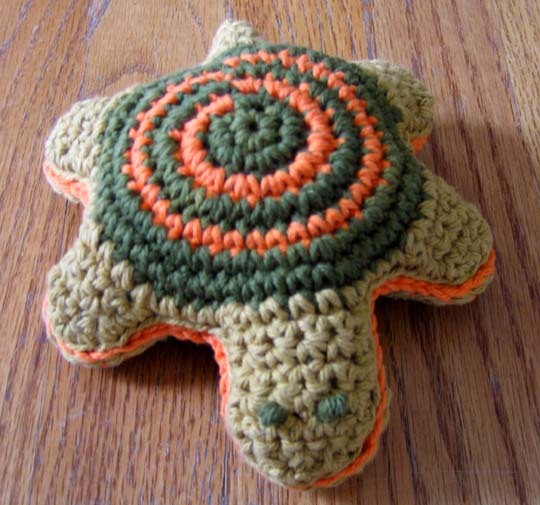 Turtle is worked in two pieces beginning with circular shell body. Head, legs and tail are attached by working back and forth in rows. Upper and lower body pieces are slip stitched together, with stuffing inserted before closure. Yarn ends can be left hanging to be worked over and stuffed inside when pieces are joined. For child and pet safety, eyes are embroidered. Wind yarn around finger once, hold circle of yarn as you insert hook into it, yo and pull loop through, ch 1, work first round over strands of circle. After first two rounds are complete, pull on yarn tail gently to close center of ring. *Insert hook in next st; yo, pull through st; rep from * once; yo,pull through all three lps on hook. *Insert hook in next st; yo, pull through st; rep from * twice; yo,pull through all four lps on hook. Note: Upper shell is worked in two colors in rounds which are joined with slip stitch. 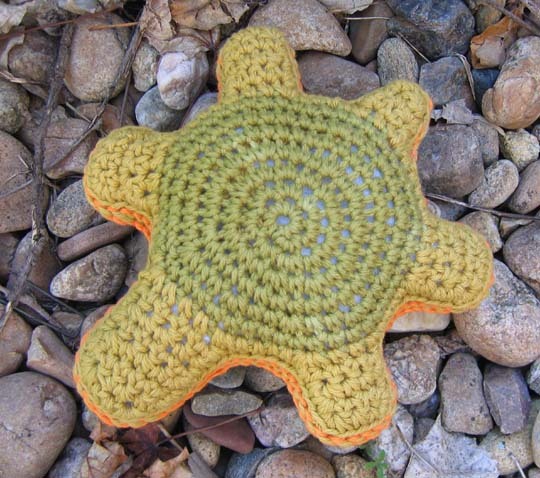 Note: lower shell is worked in one color in spiral crochet method. Note: work on upper shell piece first, then repeat same instructions on lower shell piece. You will be working around outside of circular piece in this order: head, skip 4 sc to left, first leg, skip 4 sc to left, second leg, skip 4 sc to left, tail, skip 4 sc to left, third leg, skip 4 sc to left, fourth leg. Rows 1-4 Rep Rows 1-4 of first leg. Repeat head, legs, and tail on second shell piece. Lower body edging Rep upper body edging instructions. Join upper and lower body Hold pieces with wrong sides tog, matching head, tail and legs. Working through inner loops only of ea sc, attach D through both thicknesses in any sc between tail and leg. Sl st through inner loops of ea st around, leaving tail sts unworked until stuffing has been inserted. Stuff with fiberfill (inserting optional jingle bell in center of stuffing if desired), then sl st remaining sts tog to close. Eyes With B, embroider two French knots for eyes as shown. Bury all yarn tails inside stuffed body.